Why are we willing to further erode our nation's economic progress with a stunning "ignore now, pay overwhelmingly later" game? In every respect -- human, financial, societal -- the burden of diabetes is, and is becoming, crippling. 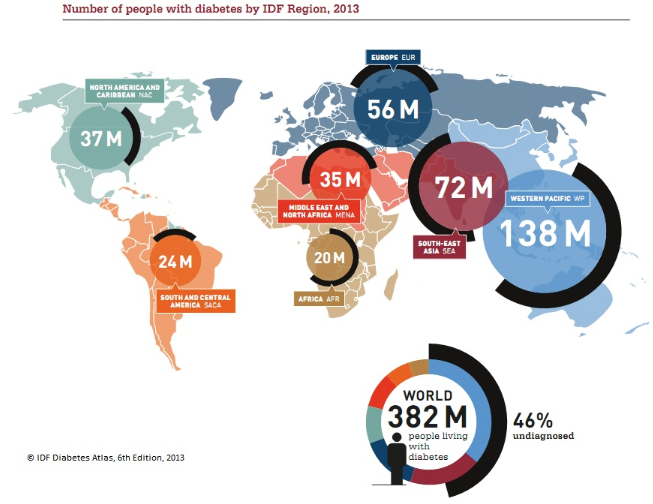 The International Diabetes Federation (IDF) -- the umbrella organization for 200 diabetes associations in more than 160 countries -- just released its 2013 Diabetes Atlas. 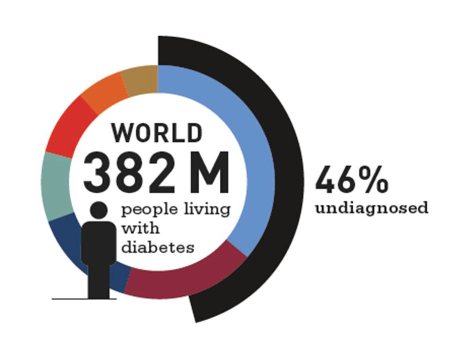 It cites current statistics and the rise of diabetes worldwide. If you've been following the trend in diabetes, it will not surprise you to know diabetes continues to rise, unabated, around the world. Type 2 diabetes, which many consider an epidemic currently, is increasing worldwide predominantly due to poor diet, sedentary lifestyle and the fact that we are living longer. 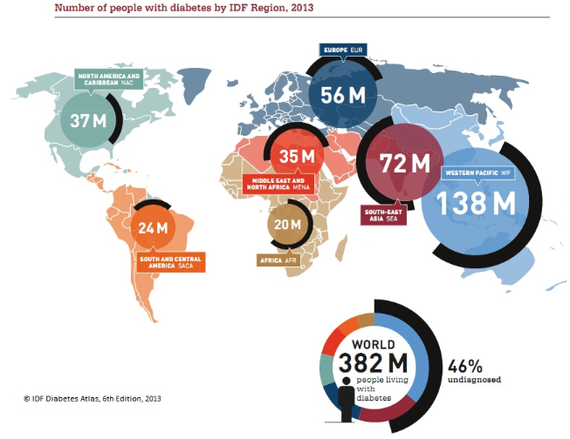 Leonor Guariguata, IDF biostatistician and coordinator for the Diabetes Atlas, told me via email something shocking. That despite being a non-communicable disease, where there are changes in risk factors and environments, diabetes will spread from one community to the other, essentially acting like a communicable disease. Already, diabetes extracts a high cost in health care dollars, economies' financial stability, lost productivity, and it destroys lives and families. 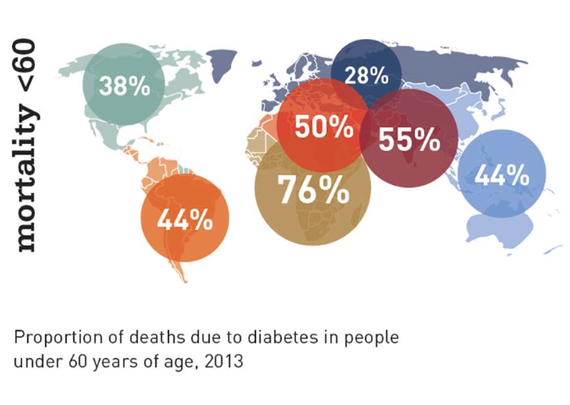 Below are highlights from the 2013 Diabetes Atlas. Sir Michael Hirst, IDF President, told me via email that research shows one in 10 of the world's population will have diabetes by 2035. New wealth and development in the Middle East has already led to one in 10 (p. 14) adults having the disease. 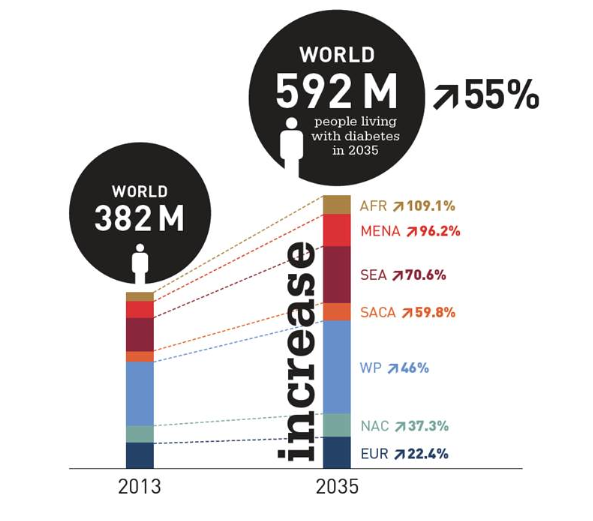 The greatest number of people with diabetes worldwide are between the ages of 40 and 59. Every six seconds (p. 14) someone dies from diabetes. Diabetes imposes unacceptably high human, social and economic costs on countries at all income levels (p. 11). In Africa, three quarters (p. 14) of diabetes deaths are in people under 60 years old, handicapping Africa's ability for development. In 2013, the world spent $548 billion (US) (p. 14) on diabetes health care -- 11 percent of the total spent for health care worldwide. 175 million (p. 11) people are currently undiagnosed and progressing toward complications unaware. The number of people with diabetes globally will increase by 55 percent (p. 13) by 2035. Sir Michael emphasized a primary reason the growth of diabetes is so difficult to halt. "Diabetes," he told me, "is not merely a health issue, but also a political issue, one which requires a whole society approach." How is it, I keep wondering, we are not paying attention? How is it we are so shortsighted that in the U.S. we put shareholder value over the value of individuals' lives? Over the need for families to be financially stable? 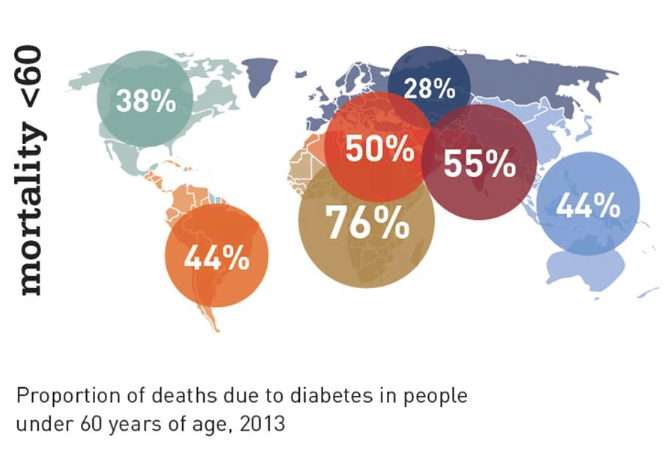 Given the epidemic is advancing most quickly in China, India and the Middle East, I asked Guariguata, "Why should someone in North America care about the skyrocketing growth of diabetes elsewhere?" Her answer: "The rise of diabetes has repercussions for everyone, everywhere. Rising costs for care, decreasing productivity and pricing and availability of food, medicine and healthcare affect us all in our global society." The refrain in public health is that, "People will make the healthy choice when the healthy choice is the easy choice." Guariguata agrees. "The only option," she said, "is a concerted global response with coordination and commitment from governments to change our environment so that healthy choices are easy, and that care, support and so that education are available to all patients, providers and the public." As in all tragedies, big numbers make the reality smaller. But it's each small, individual story that brings the reality home. Like the child and his brother in Africa who walk four hours in no shoes once a week to get insulin from the one clinic. Or the young wife in India who has sold all the family possessions to buy her husband medicine and nurse him. Or my neighbor's Type 2 diabetes that has caused her health to fail dramatically so for days she doesn't leave the apartment. So what can you do? Put pressure on your policy makers to vote for health, and create a healthier lifestyle for yourself and your family. If diabetes is in your family, make sure everyone gets a fasting blood sugar test and see whether you have diabetes or Stage 1, pre-diabetes. For me, I'll continue to use the blue circle, the universal symbol for diabetes created by the IDF in 2006, under my posts, and write and speak to help those who share this condition, and the health professionals who care for us. Riva's new book, Diabetes Dos & How-Tos, is available in print and Kindle, along with her other books, 50 Diabetes Myths That Can Ruin Your Life and the 50 Diabetes Truths That Can Save It and The ABCs Of Loving Yourself With Diabetes. Riva speaks to patients and health care providers about flourishing with diabetes. Visit her websites DiabetesStories.com and DiabetesbyDesign.com.